Oops ... No sugar? Ah, but I've got golden syrup in the cupboard. So, here they are, I made golden syrup cupcakes. As an experiment, I put everything in a bowl and mixed with an electric hand mixer. Easy does it. :) The result was surprisingly great. The texture of the cupcakes was really fine. They have an almost velvety like texture and they are very light and moist. They also have the rich sugary flavour of golden syrup. Ah, I have to mention that I put some chopped prunes which I happened to have in my cupboard. So these are really "cupboard cupcakes." Put all ingredients in the food processer and mix well. Or put all ingredients in a bowl and mix with electric hand mixer. Pour the mixture into the prepared muffin cases in the muffin baking try. When the cupcakes are baked, let them stand for 5 minutes in the baking tray, then turn them out. Chocolate and orange is a good combination. 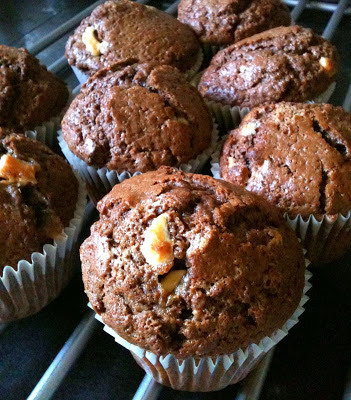 These muffins have a quite pronounced flavour of orange, but they don't have any actual orange segments or even juice. Fresh orange zest really gives an aromatic flavour. I added chopped white chocolate to compliment the fresh orange flavour. You could add more white chocolate if you wish. Preheat oven to 200 C / Gas 6 and add paper cases to a muffin tray. Measure out dry ingredients in a large mixing bowl. Measure milk and oil in a large measuring jug. Add egg and whisk well. Add the wet mixture (3) into the dry mixture (2). Stir until just combined. The mixture will be lumpy. Do NOT over mix. Then, gently fold in chopped white chocolate and zest of orange.